Leading international law firm Herbert Smith Freehills' Alternative Legal Services (ALT) recently welcomed its first summer interns from Queen's University to its Belfast office. 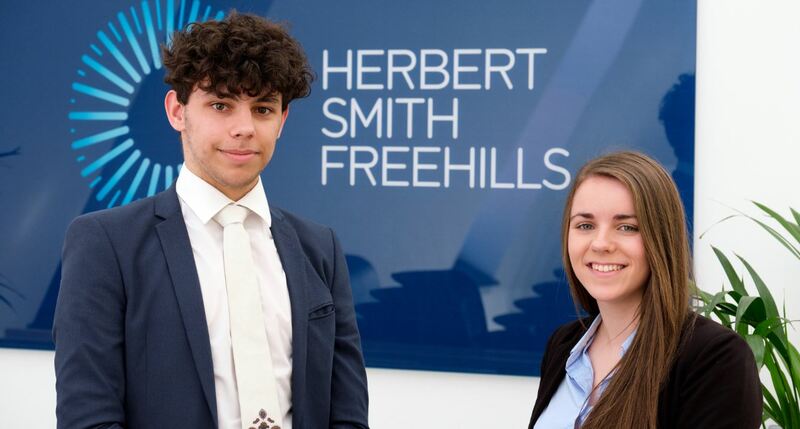 The new summer internship scheme is a key part of the tailored engagement programme for Queen's law students which is the central focus of Herbert Smith Freehills' (HSF) ground-breaking partnership with the University and sponsorship of its Student Hub. Interns Dylan McBurney from Newtownards (above left) and Joelle Houston from Belfast (right) joined the local HSF team at the beginning of July for eight weeks incorporating practical legal experience as well as skills development. The placement included a full induction week, four weeks with the HSF disputes team and three in a team of their choice – corporate and real estate respectively. Dylan and Joelle also dedicated one day per week to pro bono projects within the Belfast office. They were both able to get involved in wider firm life and attended social/networking events and participated in the various committee and network offerings in Belfast. The interns were also part of the HSF team that hosted fifteen Pathway Opportunity Programme students from Queen’s, who were spending a day (3 July) in the Herbert Smith Freehills Belfast office to find out where a university degree might take them after completing their studies. Over the summer at HSF Dylan and Joelle were assigned mentors for their placements who provided personal encouragement and support. The internship ended in late August when both individuals delivered excellent presentations to senior HSF staff on what their experience had taught them. They also gave a joint presentation on their pro bono work and the innovative web tool they developed, which will be used by the European Human Rights charity, the AIRE Centre, as the first point of information for their clients. Speaking about her experience, Joelle commented: "The HSF Belfast internship was a fantastic opportunity to gain a comprehensive insight into the inner workings of a global commercial law firm and to work alongside lawyers of all levels of seniority, on real work, in a supportive environment. “It has provided me with invaluable experience of how my studies operate in practice and cemented my desire to pursue a legal career". Dylan, who is keen to pursue a career as a corporate lawyer, added: "This internship has proved to be the best possible way I could have spent my summer; I have had the opportunity to do really interesting work with the friendliest and most approachable people, and even take joint lead on a project. “What sets my time with HSF apart from any other internship is the level of responsibility I was afforded, and the trust that went along with it – I would recommend this programme to any prospective solicitors". The summer placements and the Pathway day are two key aspects of the highly successful on-going partnership between Queen’s and HSF, which also includes a series of workshops and support for the Student Hub in the Main Site Tower which houses the School of Law at the University. HSF media inquiries should be directed to Carl Philip Brandgard, tel: +44 (0)20 7466 3244.